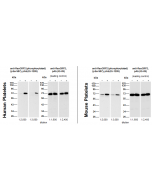 Recombinant human His-R-Ras protein purified from E. coli. 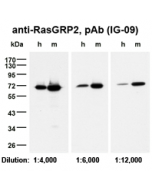 The Ras superfamily of small GTPases includes the Ras, Rho, Arf, Rab, and Ran families. Ras-regulated signal pathways control such as actin cytoskeletal integrity, proliferation, differentiation, cell adhesion, apoptosis, and cell migration. These GTPases function as molecular switches that control eukaryotic cell function by cycling between two interconvertible forms, a GDP-bound inactive form and a GTP-bound active form. The binding of GTP leads to a conformational change in the downstream effector-binding domain of the G-protein. The small GTPases are monomeric G-proteins with molecular masses over the range 20–30 kDa. Ras is attached to the cell membrane by prenylation. Mutations in the Ras family of proto-oncogenes (comprising H-Ras, N-Ras and K-Ras) are very common, being found in 20% to 30% of all human tumours. The frequency of RAS mutations is among the highest for any gene in human cancer. K-ras mutations occur frequently in non-small-cell lung, colorectal, and pancreatic carcinomas; H-ras mutations are common in bladder, kidney, and thyroid carcinomas; N-ras mutations are found in melanoma, hepatocellular carcinoma, and hematologic malignancies. Regulates the organization of the actin cytoskeleton. Rac1 (Ras-related C3 Botulinum Toxin Substrate 1) (human) (rec.) YIF-LF-P0141.